- ECO-FRIENDLY & DURABLE MATERIAL-Made from 100% natural cotton thread. Non-toxic, biodegradable, safe, healthy and durable. - CLOSET ORGANIZER & KNITTING HOLDER FITS FOR EVERYONE AND ANYROOM - Keep clutter organized in T.V. room, bedroom, kitchen, office, Playroom, Nursery, closet area, bathroom and living room. - EASY USE AND STORAGE ANYTHING- Great for stuffed animals, gloves hats and scarves, towels, a welcome basket for guests, sheet set storage. 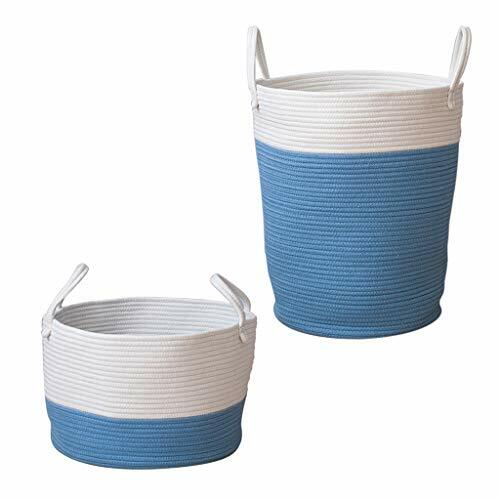 The storage basket also provides attractive, lightweight solution to many storage needs such as Clothing Storage (especially for Underwear, Skirt, T-shirt, Jacket, Pants, Blue Jeans, etc. ), Toy Storage, Baby Product's Storage, Pet Product's Storage. - SOFT AND COMFORTABLE- Soft yet firm enough to stand up on their own, Never worry to hurt Children when they are carry/drag baskets around. These are the bins they could safely play with. Or Will not scratch your floor furniture. - KINDLY NOTE-Thick and not droopy at all, Notice the baskets folded during transportation, The will stand up after you put them out for a while. Please allow 3-5cm error due to manual measurement. please make sure you do not mind before you bid. ECO-FRIENDLY & DURABLE MATERIAL-Made from 100% natural cotton thread. Non-toxic, biodegradable, safe, healthy and durable. CLOSET ORGANIZER & KNITTING HOLDER FITS FOR EVERYONE AND ANYROOM - Keep clutter organized in T.V. room, bedroom, kitchen, office, Playroom, Nursery, closet area, bathroom and living room. EASY USE AND STORAGE ANYTHING- Great for stuffed animals, gloves hats and scarves, towels, a welcome basket for guests, sheet set storage. The storage basket also provides attractive, lightweight solution to many storage needs such as Clothing Storage (especially for Underwear, Skirt, T-shirt, Jacket, Pants, Blue Jeans, etc. ), Toy Storage, Baby Product's Storage, Pet Product's Storage. SOFT AND COMFORTABLE- Soft yet firm enough to stand up on their own, Never worry to hurt Children when they are carry/drag baskets around. These are the bins they could safely play with. Or Will not scratch your floor furniture.